The cupboard for the Moomins' kitchen is now finished. I decorated it with textile ribbon. Now all the cupboard needs is some more dishes! The yellow porcelain set is a gift from my husband. Muumien keittiön kaappi on nyt valmis. Koristelin sen tekstiilinauhalla. Nyt kaappiin tarvitaan vain lisää astioita! Keltainen posliiniastiasto on lahja mieheltäni. This is so cheerful and adorable! Very nice! I love the yellow dishes and the trim looks great! I like the blue you used ALOT! Very very nice work! Suloinen kaappi ja voi namu noita astioita! Minna, it's really beautiful and love the colors!!! You have done a great work. I love the tea-set! Nice contrast to the blue shelves. Great work! The cupbaord is lovely. The trim just makes it. Wonderful. Hi, so adorable, nice colors!!!! !, beautiful work!!!!!!!! 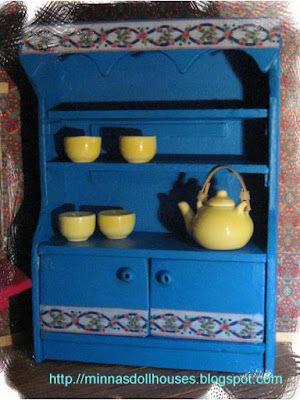 Mina,me gustaron mucho tus trabajos,especialmente el mueble de la cocina.es precioso.Te felicito.Juliana de Argentina. the blue and yellow togheter are very a good view.